What are the next steps after completing my purchase? There are two steps to completing your purchase. The first is to pay the flat fee for the Agent Assisted FSBO product. The second is to submit your listing details so we’ll have important information like your listing price, monthly common charges or maintenance, etc. You can find both steps by navigating to “For Sellers” in our website header menu bar. If you’ve just submitted your listing details and completed your purchase, thank you for your order! Please review and e-sign the listing agreement we’ll be sending you. A listing agreement is required to post your property in the MLS or RLS and even consumer websites such as the New York Times or StreetEasy. Please be patient, it will be sent later today or tomorrow if your order came in after business hours. Once you’ve e-signed the agreement, our partner brokers will upload your listing within 48 hours. In the interim, we highly recommend you read through our Agent Assisted FSBO Seller Next Steps Guide so you’ll know what to expect from our partner brokers, how to represent your role and how to manage the sale process. Good luck with your sale! Please check out the Hauseit Customer Service and Support Forum if you have more questions. Every conceivable question about every nuance of our product has already been asked here by other customers just like you. If you have a question that you don’t believe has already been answered, please post your question and it will be answered promptly by our team. How soon will I be contacted after my purchase to begin the listing process? 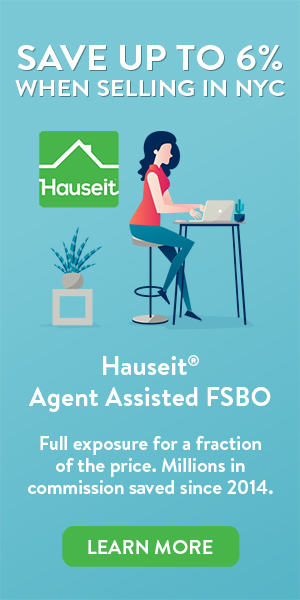 We are happy to offer our Agent Assisted FSBO sellers a 100% online registration process whereby you can submit your property information all at once. Please navigate to the “For Sellers” section of our website’s header menu bar. You will see a menu section called “Submit Listing Details.” It shouldn’t take you more than 10 minutes to complete. Once we receive your submission and take care of the paperwork, your home will then appear on your local MLS (RLS for NYC customers) and scores of relevant consumer websites such as Realtor.com, Zillow, Trulia, Brownstoner, Homes.com, The New York Times, StreetEasy and much more. All of your listings will typically appear live within 24-48 hours, at which point you may begin receiving inquiries from interested unrepresented buyers and buyers’ agents. The Multiple Listing Service (MLS) is an online database of homes for sale and rent used by real estate brokers to market their listings with other brokers and to syndicate listings to online real estate websites. In most cities, there is usually a primary MLS to which all local agents subscribe and use to source listings for buyers. In NYC, there is no single, authoritative MLS. The National Association of Realtors (the backbone behind traditional MLS systems) does not have a very strong presence in the city. You can read more about the Manhattan MLS which has now been absorbed by HGMLS. Brokerage Specific Databases – Taxi, Limo, etc. Agent Assisted FSBO sellers in NYC can expect to have their listings syndicated to all of the above RLS data recipients. This maximizes the exposure your listing will receive in front of the tens of thousands of buyers’ agents working in NYC who are searching for suitable properties for their buyers. What are the major real estate websites that my home will be listed on? Which websites your home will be listed on depends on the location of your home and which MLS system your listing is entered into. You can rest assured that your home will be listed on the most popular and relevant real estate search websites and broker databases in your area per industry standards. Will my listing look the same as a regular listing? Absolutely. Your listing will appear online just like a traditional, full-service for sale by agent listing. Brokers won’t be able to easily identify you as a FSBO (For Sale By Owner) seller so they won’t find you on a FSBO listings lead list and solicit you for a full commission listing! How long will it take for my property to be listed on all the major real estate websites? Once we have submitted your listing to your local MLS (Multiple Listing Service) or the RLS for our NYC customers, it will typically take 24-48 hours before becoming active on all major real estate websites. Please keep in mind that the syndication time could be quicker or slower depending on how responsive the various 3rd party sites are in refreshing their listing feed. Do I have to pay a real estate agent commission when using Hauseit? No, you do not owe Hauseit any commission as we are a marketing company. Furthermore, you do not automatically owe broker commission for selling your home. You only owe the buyer’s agent commission you chose to offer if you decide to sell to a represented buyer. If you sell to an unrepresented buyer, then congratulations you’ve managed to save all 6% of traditional broker fees! Because over 90% of home buyers are represented by buyers’ agents, it is encouraged to offer a competitive buyers’ agent commission in order to encourage them to show your listing to buyers. However, because over 90% of today’s home buyers begin their search online, it is likely that you will be contacted directly by some buyers who do not have agents. You have the freedom to accept bids made either directly by buyers (zero commission / Realtor fees) or with representation (you only pay a buyer’s agent commission). Can I still sell my home by owner without paying a commission if it is listed on the Multiple Listing Service? Absolutely. You have complete freedom to sell your home to an unrepresented buyer and pay zero commission or Realtor fees. How will I be contacted by buyers or agents representing buyers? Our partner brokers will ensure that you receive all inquiries related to your listing, whether they be automatically transcribed voicemails, texts, emails or messages taken by their front desk. Soon after listing you will begin receiving inquiries from both potential buyers as well as agents representing buyers. How long will my listing remain on MLS and other major real estate websites? Your listing will remain for up to six months, giving you plenty of exposure to potential buyers. You can ask to de-list at any time by simply sending us an email or using our handy listing update form. How many photos can I include with my RLS or MLS listing? You can include the maximum number of photos and floorplans permitted by your local MLS or the RLS. We recommend uploading fewer than 10 photos and floorplans. Will I need to sign a listing agreement? Yes. Our affiliate listing broker will need your permission to advertise your property and offer a buyers’ agent commission in MLS or RLS. Moreover, many portals such as RLS and StreetEasy do not permit non-exclusive listings on their platforms. However, the modified listing agreement you will sign is highly favorable to you in language. You do not owe our affiliate listing broker any further commission besides the flat fee which you’ve already paid. Moreover, you are free to cancel anytime without penalty by email and your listing will be deactivated within 24 hours. Furthermore, you are free to sell or not sell to any unrepresented or represented buyer as you wish. Unlike traditional Exclusive Right to Sell Listing Agreements where the owner is obligated to pay 6% as long as a “ready, willing and able” buyer has been found at their listing price even if they decide not to sell, you have the freedom to price your property lower to attract a bidding war without fear of being obligated to sell and pay commission! It’s an enormous advantage for you versus traditional home sellers! What if I want to make a change to my RLS or MLS listing? Please submit your listing update on our website and your changes will automatically be made by our affiliate within 1 business day. You can find the submit listing update form by navigating to “For Sellers” on our website’s header menu bar. We offer an unlimited number of changes to your listing; however, Hauseit and its affiliates reserve the right to limit or charge for additional change requests if they are deemed to be excessive and unreasonable. Am I able to cancel my listing agreement anytime with no penalties? Absolutely. You are welcome to cancel anytime without any reason, penalty or obligation to Hauseit or our affiliate broker. There are no time restrictions of any sort and you are free to pursue a sale with another broker once cancelled. Since we have already invested the time to list your property, we will not be able to refund the flat fee. What if I need to extend my listing or re-list my home? Please read our guide on how to re-list your home if you’re interested in putting your home back on the market. Please note that we do not have control over third party websites and cannot guarantee that certain websites will re-set your days on market. Where is your List Your Home Online service available? Our Agent Assisted FSBO service is currently available in New York City, the Hudson Valley and Long Island. We service NYC through the REBNY RLS. We service Westchester, Bronx, Orange, Putnam, Queens, Dutchess, Ulster, Rockland and Sullivan Counties through the Hudson Gateway MLS. We service Nassau, Suffolk and Queens Counties through the Long Island MLS. We are currently focused on providing the best service for our customers in New York so we are on hold in Boston, Philadelphia, Chicago and San Francisco. We are helping owners list more property via our Agent Assisted FSBO product every day and will be in more cities very soon! What is included in the standard photography package? Our professional photography package includes approximately 1 hour on site with a seasoned architectural photographer. Expect up to 10 interior and exterior photographs, staging & lighting, digital editing and retouching with online delivery of the finished product within 1 business day of the shoot. Our photographers typically need a minimum of 24 hours notice to schedule an appointment once you’ve purchased our professional photography product. Please check out our professional photography product page for more details. We encourage you to take a look at our study on the benefits of professional photography in real estate sales and to look at some of our before and after photos in the article! Am I required to purchase this service to list my home online? It is highly recommended that you have professional quality photographs before listing your home for sale. Even though Hauseit may allow amateur photos to be submitted, Hauseit makes no guarantee that any of our partner brokers will agree to upload a listing with embarrassing photos. The damage to their reputation is simply not worth it, and our partner brokers have no obligation to accept a listing from us. We recommend using one of our experienced, architectural photographers to present your home in the best light. Not having professional real estate photography with proper staging and lighting is one of the top 3 reasons why FSBO sellers fail. We strongly encourage you to invest a few hundred dollars in your home sale! How will I receive the photographs? Once photographs have been digitally re-touched and edited, they will be automatically uploaded along with your listing. You will be able to download your photographs if you wish by visiting any number of real estate search websites such as the New York Times, StreetEasy or Zillow. Simply Google your address and you’ll find plenty of websites which have your photos. Our affiliates do not have photographs of different resolutions or formats for you so please download your photos directly online. They are yours to keep! After your photo shoot, your photos will be digitally re-touched and enhanced. This process takes approximately 1 business day. Once our partner brokers have received the finished photographs, you can expect your listing to be uploaded within 24-48 hours. How soon will I be contacted after my purchase to schedule a professional photography session? You will be paired with an experienced, local real estate photographer and contacted within 24 hours of your purchase to schedule an appointment. What services will the agent provide during the open house? A licensed real estate agent will provide all of the services you would typically expect from a full commission broker during your open house. He or she will greet guests, answer questions and encourage guests to sign in. Your agent will be on site for two hours to manage your open house. You will be provided with an electronic copy of the attendee list after the open house. Do I have to sign an exclusive listing agreement with the agent? Absolutely not. Your Open House Agent will typically come from the same affiliate brokerage listing your property. Are you sure there is no sales commission involved? There is no sales commission involved. You do not have to pay commission to the agent just for hosting your open house. Who are these Open House Agents? Our Open House Agents are licensed real estate agents or brokers. Most are full time real estate professionals who are happy to conduct your open house because they don’t happen to have any showings that day. What will my Open House Agent know about my home? Our partner agents can show up 10 minutes prior to your open house to meet with you and to learn more about your property. They’ll arrive with a sign in sheet and complimentary refreshments, dependent on availability. Am I required to be present during my open house? Absolutely not. It’s important to have a neutral party show the apartment. Showings should always be focused on the property itself vs the owner, so please let them take it from there! What is included in the standard floorplan package? Our professionals will spend on average 1 hour on site to make measurements of your property. You will receive a industry standard 2D black and white scaled drawing with walls, doors, windows, fixtures, room descriptions and dimensions. Finished floor plans are usually finished within 1 business day of the drawing, which typically is done at the same appointment as your professional photography shoot. What if I can’t find my original floorplan? Our professionals can create an original floor plan for you by conducting an on-site measurement. Just let us know when you’d like us to come measure your home. What will my floorplan professional do? Our floorplan professionals will conduct an on-premise measurement of your property and draw a high-quality marketing floor plan. It will provide prospective buyers with a clear illustration of the unique layout of your property. What if I just want my original floorplan re-drawn? Simply email us your original floorplan and we will give you a quote after reviewing. In many cases the cost of re-drawing a floorplan will exceed the cost of creating a new floorplan. In rare cases, it’s conceivable that your original floorplan may lack critical information necessary for us to produce an accurate redraw. We will be back to you within one business day of your submission. How long will my on-site visit last? Expect roughly half an hour for every 1,000 square feet. When can I expect my floorplan to be ready? Typically 1 business day if the floorplan is under 2,500 square feet. Each additional 2,500 square feet may require an additional business day. How soon will I be contacted after my purchase to schedule an on-premise measurement of my property? We will contact you to schedule an appointment with our affiliate within 24 hours of your purchase. Is it necessary to hire an attorney to sell my home? While not necessary in every state when there is a real estate agent involved, it’s definitely necessary and recommended in New York to have an attorney to guide you through disclosures, contracts and closing. We’ve vetted hundreds of lawyers in your area with experience in For Sale By Owner transactions so you can have an experienced guide along the way. What questions can I ask during the introductory consultation? Ask any questions you would like, from an overview of the For Sale By Owner process, timing and costs to the disclosure forms particular to your state. You can also discuss fees for full representation directly with the lawyer. Many For Sale By Owner sellers find transaction attorneys to be a helpful resource for papering a transaction especially when there isn’t a real estate agent involved. How long can we speak for? Your attorney will be happy to have an introductory conversation about your transaction, generally no longer than 30 minutes. You can choose between a telephone call or an in-person meeting at your attorney’s offices. How soon will I be contacted by an attorney? You can expect to be contacted by a local real estate attorney with transaction experience within 24 hours. What happens if I want to hire the attorney? You are free to work with the attorney directly after your introductory call. You don’t owe us anything further! Attorney fees are negotiable between you and the attorney. The cost is typically a flat fee of a few thousand dollars, half payable upon signing an engagement letter and half payable upon closing. Sometimes, real estate attorneys will be fine with taking the entire fee at closing. What is included in the standard appraisal package? A licensed, state-certified real estate appraiser who has experience in your locale will visit your home and conduct a full on-premise inspection of both the interior and exterior of your property. Expect the inspection to last approximately one hour, dependent on the uniqueness of your home. Your local appraiser will provide you with a full appraisal report within 72 hours. What valuation methodologies can I expect? While the approach to valuation will vary from property to property, we will always include a market valuation backed up by comparable property analysis (i.e. other residential properties that are similar to yours in respect to lot size, neighborhood, and square footage that have recently sold and their selling price). Your valuation report may also include other approaches like Salvage Value, Replacement Cost New, etc. For each type of valuation there will be a clear discussion as to why it’s applicable to the particular real estate appraisal situation. This way you’ll understand more about how the appraiser arrived at the final monetary value of your property. Do I need to get my home appraised to sell it? Absolutely not. However, a professional real estate appraiser can give you unbiased information and advice which should help you price your home closer to its market value. What is the point of paying for an appraisal if I’ve already hired a real estate agent? An objective, 3rd party appraisal counteracts many of the conflicts of interest inherent in the broker/client relationship. For example, a broker desperate to get a listing agreement to sell your property may tell you your property is worth far more than the market will actually pay. Moreover, an agent looking to make a quick sale may tell you that your house is worth less than it could actually fetch on the market. Can I purchase this service if I am not listing through Hauseit? Yes. All of our products can be purchased independently even if you are not listing your property with us. Can home buyers use this service? Yes. It never hurts to have an independent, third party appraisal conducted. Keep in mind that if a buyer is planning on purchasing with a mortgage, the bank will typically require an appraisal to be conducted by a firm of their choosing. How soon will I be contacted after my purchase to schedule an appraisal? We will contact you to schedule an appointment with a licensed real estate appraiser within 2 business days of your order. Where can I learn more about your full service listing option? Please check out the extensive FAQ section in our 1% for Full Service product page. Where can I learn more about your buyer services? Please check out the extensive FAQ section in our Buyer Closing Credit product page. Have time to show your home? Save all 6% with an Agent Assisted FSBO in New York. Too busy to sell For Sale By Owner in NYC? Work with a reputable, highly experienced broker for only 1% commission!